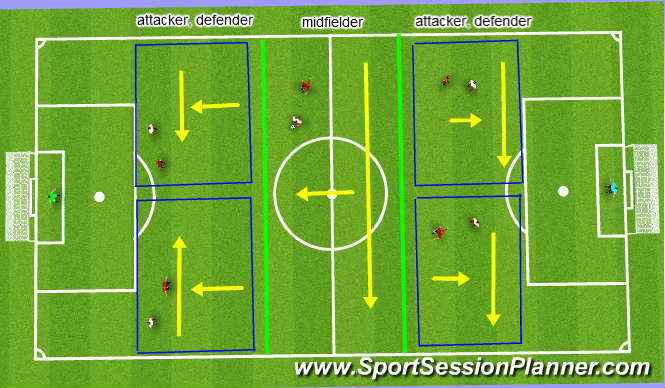 This is a 5 a side game which has a focus on positions, movement and passing. On the pitch as a whole there are 5 squares. In the four blue these are designed for attackers and defenders only. In these areas only these players can move within these zones so you will be looking for movement to pull defenders away from goal or create space to get the ball and score. The green zone is for midfielders if the defenders win the ball goes into the green zone and they attack to the oppisitions blue zones, in the blue you should be looking for movement, awareness and vision to find the attackers. Coaching points: Quality of pass, vision, awareness and movement.